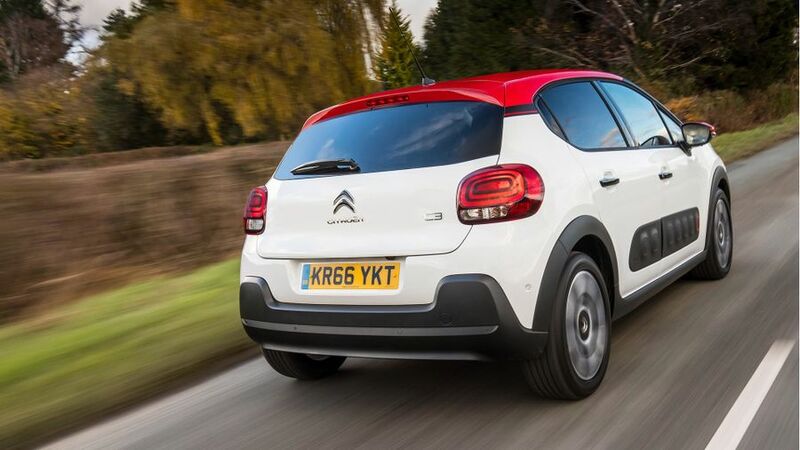 The C3 certainly isn’t a class leader among the very impressive array of superminis on offer in today’s market, because – looks aside - it doesn’t really dazzle in any single area. It is, however, a very charming and likeable little car, with bags of style and some fairly tempting equipment. And for many supermini buyers, that’ll be more important than dynamic excellence or practicality. While previous Citroen C3s have generally been blander than a sawdust sandwich, the latest version has properly head-turning styling that would look more at home on a motor show concept car than on an affordable supermini. Following in the footsteps of the C4 Cactus, the unusual details and unconventionally bulbous lines command plenty of attention, while the top spec version also has ‘Air Bumps’ (they’re also optional on the mid-range car). These are rubberised panels containing pockets of air that run down each side of the car, providing a futuristic look, as well as a small amount of protection against the effects of a runaway shopping trolley. The trim level you choose has several implications for the looks of your car. Entry-level Touch models miss out on alloy wheels, while Feel trim checks that box and adds body-coloured door handles, wheel arch extensions and a contrasting gloss black finish for the roof and door mirrors. 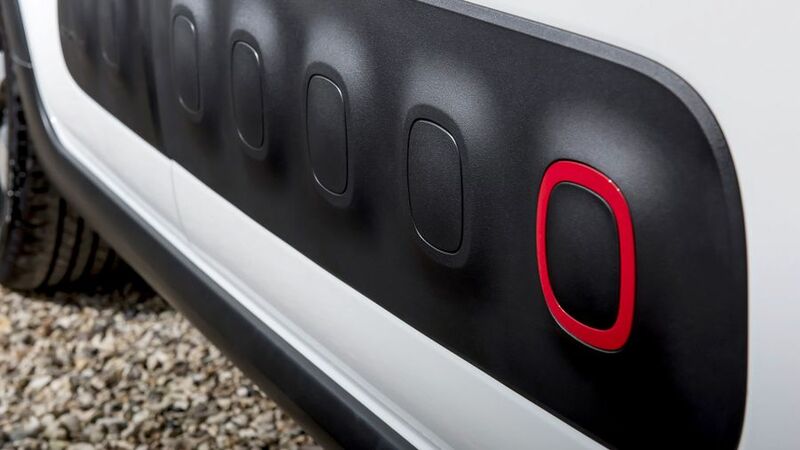 On top of the Air Bumps, Flair models add coloured foglight surrounds and darkened rear windows. 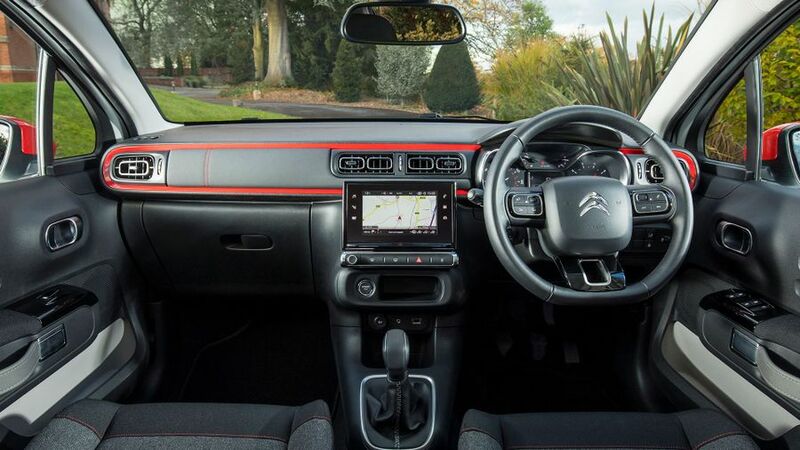 For many buyers, the C3’s stylish exterior will be enough to guarantee a purchase, but the funky design on the inside will also help cement the deal. Again, the design is fresh and unconventional, giving you a very chic-feeling environment to sit in. Like in the Cactus, the materials aren’t of the highest quality – a few of the panels are downright cheap-feeling – but there’s such a mixture of finishes, textures and colours that you don’t notice as much as you otherwise would. Ergonomically, though, the C3 isn’t nearly so appealing. The touch-screen infotainment system looks good and drastically cuts the number of buttons on the dashboard, but it’s also woefully awkward to use; the menus are confusing and it’s very slow to react to your inputs. And, although there’s height- and reach-adjustment for the steering, the wheel doesn’t go far enough away from you. These days, the best superminis are roomy enough to accommodate four lofty adults with relative ease, and that’s something the C3 can do as well as many of its rivals. Rear head-room can be a little tight if you specify a car with the panoramic sunroof, but even then, it’s only those over six feet tall that’ll struggle. It’s more comfy than most superminis for five people, too, because the middle seat is wider and softer than those in pretty much any rival, and it’s only the shortage of shoulder-room and the bulky transmission tunnel that’ll put a dent in your level of comfort. The boot is a decent size at 300 litres, too, but there’s a large lip to muscle heavy items over, and there’s nothing particularly clever about the way the seats fold down, leaving you with a sloped loadbay. Citroen’s goal with its forthcoming batch of models is to focus wholeheartedly on comfort over sportiness, which in itself, is no bad thing. However, even the latest car is based on a platform that can be traced back many, many years, and there’s only so much even the best engineers can do with tweaks and modifications. They’ve made the suspension decidedly soft, so it mops up bigger lumps and bumps pretty well, but sharp-edged ruts can really be felt knocking into the cabin, and there’s a slightly unsettled quality on cracked urban roads. That softness also means there’s a pronounced amount of body lean, and you’ll feel the body pitching and wallowing untidily over undulating roads. What’s more, you’ll notice there’s virtually no consistency between any of the controls: each pedal feels like it’s from a different car and the gearshift has a laughably long and notchy throw. The steering has quite a sizeable dead spot around the straight-ahead, too, but the light weighting is perfect for use around town. Several engines are available, and importantly, we’ve tried the 81bhp three-cylinder 1.2-litre petrol that’ll account for the vast majority of sales. It feels a fraction stuttery at the very bottom of the rev range, but it gets a good bit perkier in the mid-range and has enough gutsiness to get you chuffing along at a pretty decent rate. It’ll thrive in a town centre environment and happily keep up with motorway traffic. There’s not much point extending it out to the top of the rev counter, because the acceleration you feel doesn’t ultimately get all that much stronger. The engine makes a bit of a racket when you work it hard, too, and you start to feel more unwanted vibrations through the controls. Otherwise, though, the refinement isn’t at all bad, with wind- and road-noise being really well suppressed. We’ve also tried the turbocharged version of the 1.2 engine, which gives 108bhp. It feels impressively punchy, especially in the mid-range, and it’ll deliver all the pace and flexibility that most C3 buyers will ever need. However, we’ve also tried this engine with the optional six-speed automatic gearbox rather than the standard five-speed manual, and it’s not nearly so impressive. It feels like much of the engine’s power is being sapped by the transmission. 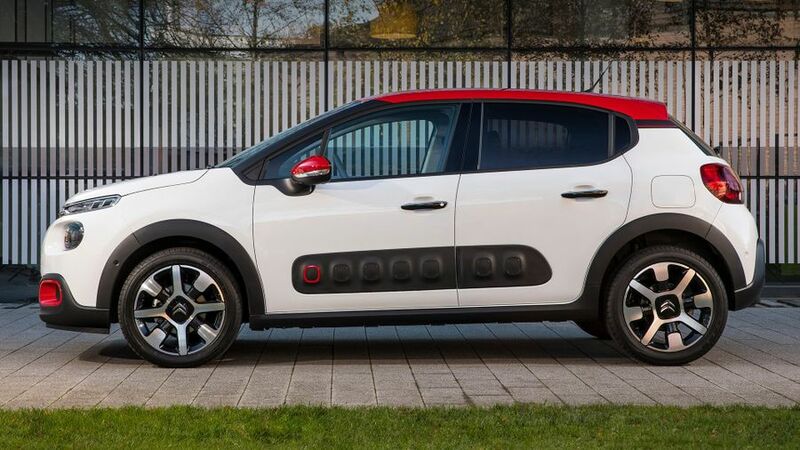 Like any Citroen, the C3 will live and die by its price, and we can’t help feeling Citroen could have been a shade more aggressive on this score. Yes, it’s a little cheaper than superior offerings like the Ford Fiesta and Volkswagen Polo, but it is genuinely only a little. Prices are comparable to those of the Seat Ibiza and Renault Clio, but again, these cars are better all-rounders and arguably just as stylish. It’s a little tough to say how the C3 will fare on residual values, too, although Citroens don’t usually deliver a great performance in this area. Generally, the efficiency figures are nothing to jump up and down about. All the diesels duck below the 100g/km mark for CO2 emissions, but the petrol versions everyone will buy fall quite a way short. The best-selling 81bhp engine, for example, delivers official figures of 109g/km and 60.1mpg. Citroen doesn’t always have the best rep in this regard, but according to some of the data we’ve seen, this might not be all that fair. The brand currently sits in a solid mid-table position in the manufacturer rankings of Warranty Direct’s Reliability Index, and the C3 scores pretty well as an individual model, too. That said, the three-year/60,000-mile warranty provided isn’t all that generous compared with what some rivals provide. The C3 comes with a good amount of safety kit as standard. This includes the six airbags, stability control and tyre pressure monitoring you expect, but also adds the lane departure warning and speed limit recognition systems you probably don’t. The range-topper also comes with a forward-facing camera built into the rear-view mirror that automatically records any shunt to make insurance claims easier. However, it also allows you to take stills and video at will by hitting a button. How safe your driving becomes will probably depend greatly on how much you muck about with it. The car has been crash tested by Euro NCAP, and scored a reasonable four out of five stars. 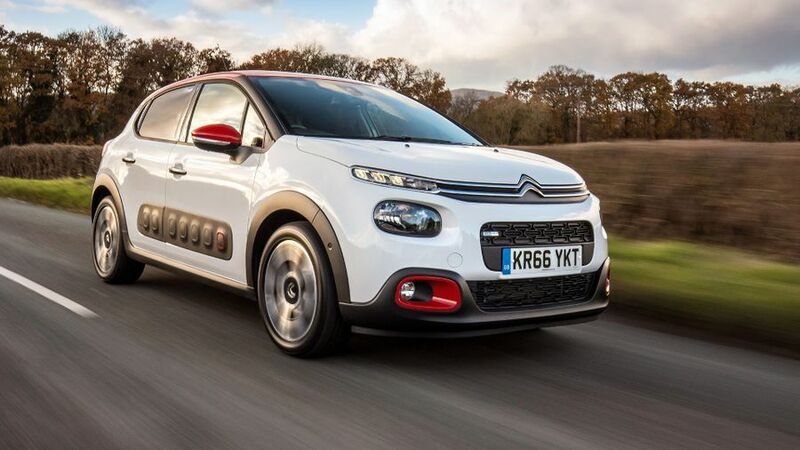 Choosing the C3 will give you some very tempting kit on top of that provided by rival superminis. Entry-level Touch trim gives you remote locking, cruise control, DAB radio and Bluetooth, but you’ll probably want to upgrade to Feel trim at the very least because it gives you alloy wheels, climate control, four powered windows and the touchscreen stereo with MirrorLink and Apple CarPlay, along with a few visual upgrades. Top-of-the-range Flair trim earns you the Air Bumps, cornering foglamps, automatic lights and wipers, rear parking sensors and a reversing camera, along with a ‘dashcam’ mounted in the rearview mirror that’ll take stills or video at your command and download them straight to your smartphone via Bluetooth. If style and uniqueness are at the very top of your list of priorities – and in such an image-conscious sector of the market, there will be a significant number of people to whom that applies – and you’re prepared to forgive a few shortcomings in other areas, the C3 will be right up your street. Like its sibling, the C4 Cactus, there are a lot of rough edges to the C3, but few small cars are as charming and as likeable.